Now, BreakMaster comes with a great DVD. In a recent issue of Golf Magazine, the BreakMaster Digital Green Reader was featured as one of the coolest new putting aids on the market. The article points out how the BreakMaster Owners Manual comes with tables (like the one on the right) that quantify the amount of break that putts will receive at different slope and putting distances. Exelys is the only company in the golf industry that has ever done this kind of serious research to better inform golfers about how putts react to the break on the green (and take the guesswork out of putting). That’s why hundreds of Tour Pros (including all the top names) on the PGA, Champions, LPGA and other tours rely on the BreakMaster to improve their putting and tell them how greens will break at tournaments. This kind of publicity in Golf Magazine (circulation 1.4 million) will mean your customers will be looking for the BreakMaster. Make sure your inventory is well stocked. Vijay Singh joins over 60 Tour Pros and caddies on the PGA, LPGA and Champions Tour who are currently using the BreakMaster for practice rounds and to help improve their green-reading abilities. But of course the BreakMaster isn't just for the pros: it helps golfers of all abilities improve their green reading, get to know the greens on the courses they play and lower their scores by making more breaking putts. 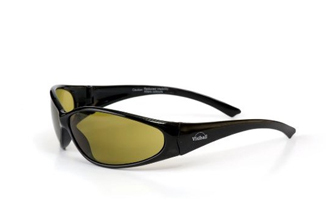 Purchase yours today using PayPal. The slope of the green is the single biggest factor in how much your putt will break on the way to the hole, but the fact is: most golfers have a hard time reading it. And why shouldn't we? Our eyes were made for seeing, not for taking accurate measurements of level. For most of the distance of your putt, the force of your putter stroke is the determining factor on how the ball will roll. But as the ball slows down on its way to the hole, the power of your stroke has progressively less effect as the force of gravity takes over. This is why the ball breaks the most as it nears the hole. Sometimes you think you know which way a green is going to break, but then the ball breaks differently than your eyes "told you" it should. The reason for this is that golf course designers often deceive our eyes by use of the terrain surrounding a green. Trees, bunkers, mounds and swales all play a part in these optical illusions. This problem is made even worse if you're playing in a hilly or forested area where you can't find a visible horizon line for reference. The value of reading greens by plumb-bobbing with your putter has been called into question by leading putting experts. There are two reasons for this. First, most putters don't hang in true "plumb." 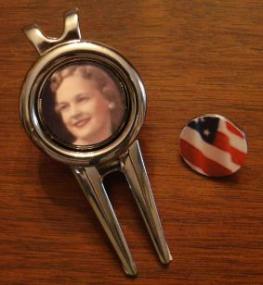 They're made for putting, not for measuring slope. The second reason plumb-bobbing doesn't work is that you need to be practically laying down on the green surface in order to read the rim of the cup as a horizontal line intersected by the vertical plumb line of your putter: inconvenient at best. So how do you find the true break of a green? How Much Will My Putt Break? 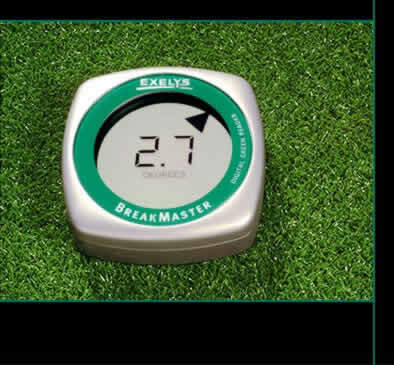 The BreakMaster will tell you accurate information about what's happening on the green that your eyes can never see: the exact break direction (downhill) as well as the exact amount of break (shown as degrees of slope). But once you have this information, what do you do with it? How do you put BreakMaster data into practical use to adjust your putt? At Exelys, we've done extensive testing in real-world situations to find out how much putts will actually break at various kinds of slopes. We've tested on greens of different types (bent grass, Bermuda grass) at varying green conditions and with various popular brands of golf balls. The following table can be a useful general guideline to helping you adjust your putt. 1 Degree 4 - 6" 10 - 12" 14 - 18"
2 Degrees 8 - 10" 16 - 18" 22 - 26"
3 Degrees 10 - 12" 20 - 24" 40 - 46"
4 Degrees 14 - 16" 38 - 42" 52 - 58"
Note: all of these measurements were taken putting straight across the break, meaning at a right angle to the downhill line (the break or fall line) which is indicated by the arrow on the BreakMaster display. As you would expect, for each degree of break, a putt will break more and more depending on the length of the putt. Therefore, putting across a 1Degree slope (a fairly shallow break) can yield a break ranging from 4" for a 3 foot putt to 18" for a 9 foot putt. Likewise, putting across a 4 Degree slope (a much more severe slope angle) can yield a break ranging from 14" to 58" (over 5 feet of break!) depending on the length of the putt. The drawings on the left illustrate the various readings from the table. 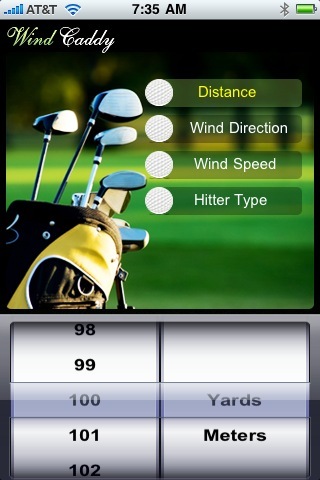 You'll see that as the distance of your putt increases, you need to increase the amount of offset for your Aim Line. So for a 3 foot putt across a 1 Degree slope you need to adjust your Aim Line 4 - 6" from the hole to sink the putt, whereas if you were putting 9 feet across this same slope you'd need to adjust your Aim Line 14 - 18". These numbers may change slightly depending on the speed of the green, and whether the green is wet or dry, so adjustments should be made to your putt according to these additional factors. We recommend entering these numbers in your Greens & Yardage Book to take out on the course with you. Another interesting factor that can be useful on actual greens is that the Offset Angle (meaning the amount you must adjust your Aim Line uphill from the cup) is consistent (for each degree of slope) no matter what distance you are putting. Referencing the table and the drawings you will see that, for example, a 2 Degree slope requires a 15 Degree Offset Angle from the hole. So, whether your putt is a 3 footer or a 9 footer, you need to adjust your Aim Line 15 degrees uphill from the hole and then make your stroke. So once you know the amount of break (degrees of slope) this gives you another means of adjusting your Aim Line for your putt - sometimes far beyond what your eyes might tell you. Not every breaking putt is going to be at exactly 90 degrees to the downhill break line. So how do you adjust the above numbers to fit these situations? Again, knowing the exact break direction (by using the BreakMaster) is infinitely preferable to merely guessing which way the ball might break. By showing you the exact downhill break of a given putt, the BreakMaster allows you to see whether you're putting uphill across the break, or downhill across the break. Each of these putts will react differently, but in a predictable manner. Uphill breaking putts will break LESS than putting straight across the break. 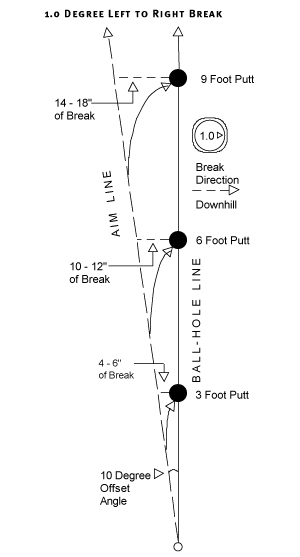 Downhill breaking putts (known as the "downhill slider") will break MORE than putting straight across the break. So on the green, if you're putting uphill across the break, allow for a little less of a break. Likewise, if you're putting downhill, allow for a little more of a break than you would see in the numbers in the table. Without accurate information, you have two choices: trust your memory (from previous rounds) or guess. Rest assured, Pro Golfers and Caddies never guess. When you're on the Tour, every stroke counts. So Pro Golfers and their Caddies take time before tournaments to make careful measurements and notations on greens and then use that information to adjust the aim line of their putt during the tournament. And the number one tool chosen by more and more Tour Pros and Caddies to measure greens is the BreakMaster Digital Green Reader. 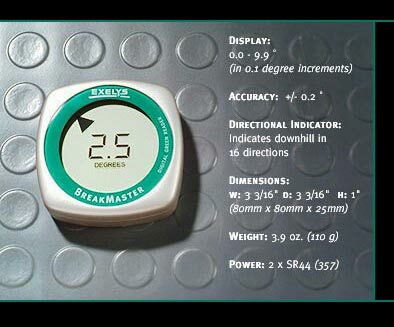 The BreakMaster Digital Green Reader is a precision electronic device that accurately locates the downhill direction (or break) of the green, measures the precise angle of slope (amount or severity of break) and provides a full readout of both on its LCD display. To read a break, simply place the BreakMaster near the hole on line with your putt and it will instantly show you the downhill direction and exactly how many degrees of downhill slope exist. The greater the angle of slope, the more the putt will break downhill. The shallower the angle of slope, the less the putt will break. 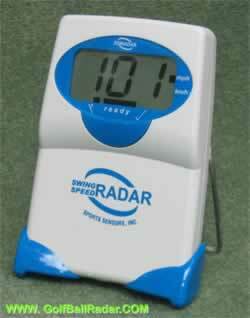 The BreakMaster works equally well in reading the severity of an uphill or downhill lie. Simply place the BreakMaster ahead of your ball on line with the hole and its readout will give you a good indication of how much to adjust your stroke for uphill or downhill putts. Since its introduction in 2003, the BreakMaster has become an indispensable tool for Tour Pros on the PGA, LPGA and Champions Tours as well as Professional Caddies and Golf Instructors. See below for the Golf Pros that are currently using the BreakMaster. What all these great golfers are discovering is that using the BreakMaster in preparation for upcoming tournaments allows them to train their eye for breaking putts and also to get to know the exact breaks on the greens they will be playing in the actual competition. While the use of devices like the BreakMaster (as well as laser range finders) is prohibited during tournaments, there is nothing illegal (according to the USGA Rules of Golf) about using the BreakMaster during a practice round or walk-through of the course, then making notes in a Greens & Yardage Book on how the greens will break, and then to consulting that book during competition. Tour Pros know that, in order to shave strokes off their score cards, there's no substitute for actual knowledge of how a golf course is going to play. And there's no better way to understand breaking greens and take the guesswork out of green-reading than by using the BreakMaster Digital Green Reader. The BreakMaster is slim and compact so it fits easily into a pocket without spoiling your stroke, it's weatherproof to withstand damp greens and comes with a protective carrying pouch that can attach to your belt or bag. 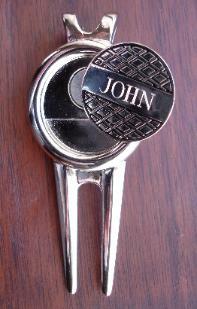 The BreakMaster is available at fine golf shops everywhere. If you can't find the BreakMaster at a dealer near you, you may order it directly from us by clicking on the link below. 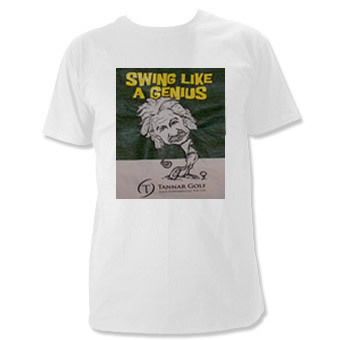 See and order all or my products at my golf product order page.